It's 11pm in Central NJ ... bone-melting heat outside ... time to crank up the oven! I somehow managed to carve out a little time to post a recipe for the Improv Challenge, where members are given a couple of ingredients and must come up with a recipe of their own. 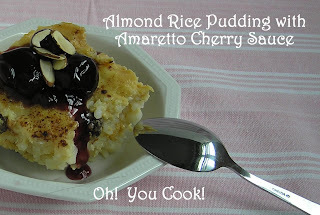 This month's challenge is to use cherries and almonds. What a yummy combination! I decided to play off my recipe for stovetop vegan rice pudding, tweaking a few ingredients here and there to make a brand-new baked dairy version. Then I added my favorite cherry sauce topping (which for some reason I had never before shared with you, Dear Reader), spiking it with Amaretto, and, of course, garnishing with almonds. I use tapioca starch as the thickener because it makes a clearer, and I think prettier, sauce than if cornstarch or flour is used. Feel free to use 2 teaspoons cornstarch if you don't care how your dessert looks.